This is the first part of my commission for a new Lidl store in Kingswood, South Gloucestershire. 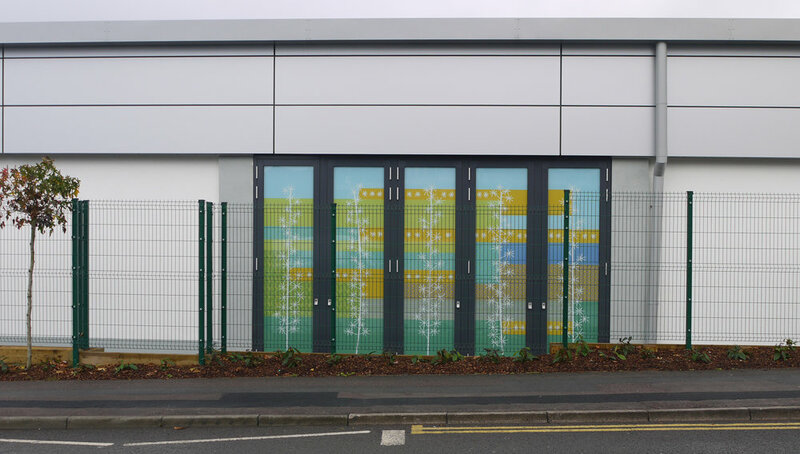 The side of the building is on a residential street, so the standard elevation has been enlivened with a series of "windows" and a design printed on opaque vinyl that links the three sets of panels with ribbons of colour and pattern. As you can see from the two sets of designs above, things change during the building process. Where there were four windows per set, there are eventually five. Where the landscape design took account of these windows, in the end it didn't and there was a fence with a banner on it partly obscuring the end windows that announced the opening of the shop in November (below). However, I am happy with my design. The geometry goes well with the grids of the building and the fence, the stars in various forms link with the lines of trees and upright posts and the colour scheme looks just right under the grey or the blue sky. In the details taken from the partially obscured windows (who knows, the banner may have been removed by now) you can see different types of stars and details from local buildings both printed and reflected in the vinyl.